The Basilica of Sts. 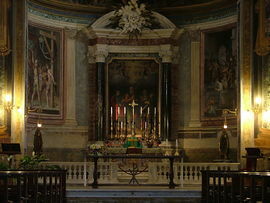 Vitalis, Valeris, Gervase and Protase is a titular minor basilica church in Rome. The Roman Catholic church is commonly named Basilica di San Vitale. The Cardinal Priest of the Titulus S. Vitalis is Adam Maida. The basilica was built in 400 with funds provided by Vestina, a wealthy dowager, and was consecrated by Pope Innocent I in 401/402. The dedication to St. Vitalis and his family (Saint Valeria, his wife, and Sts. Gervasius and Protasius, their sons) is dated to 412. This article uses material from the Wikipedia article "Basilica of Sts. Vitalis", which is released under the Creative Commons Attribution-Share-Alike 3.0 License.